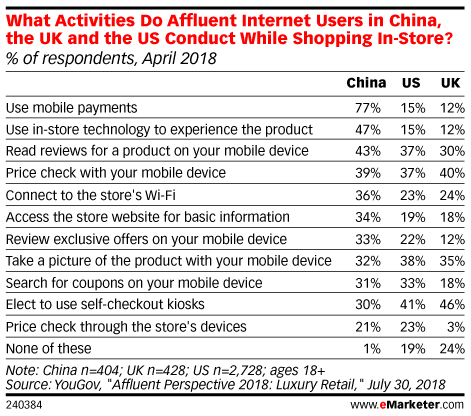 Data is from the July 2018 YouGov report titled "Affluent Perspective 2018: Luxury Retail." 5,824 affluent internet users ages 18+ in 13 countries/regions were surveyed online in two waves during March and April 2018. Respondents were from Australia, Canada, China, France, Germany, Hong Kong, Japan, Saudi Arabia, Singapore, South Korea, the United Arab Emigrates, the UK and the US. All respondents belong to the top 10% by income, except for France (top 5%), Germany (top 5%), the UK (top 5%), and the US (top 0.5%-10%). The samples have been weighted and are representative of adults ages 18+. The margin of error between countries is +/-5 percentage points.